All through elementary school, Michael couldn’t sit still in class and frequently interrupted his teachers. He never seemed to be able to focus long enough to get his work done. His grades suffered. Now in the sixth grade, he was diagnosed with attention deficit hyperactivity disorder (ADHD) and started taking medication. Although Michael’s concentration has improved, completing homework assignments is still difficult and he’s embarrassed to ask his teachers for help. He is often sad because he feels different from his peers and doesn’t have a lot of friends. Though they want to be supportive, Michael’s parents aren’t sure what to do to help ease his transition to middle school. 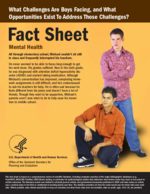 (*) This fact sheet is based on a comprehensive review of the scientific literature, including computer searches of major bibliographic databases (e.g., PsycINFO, MEDLINE/PubMed, EBSCOhost) looking for epidemiological studies that determine what factors make boys more or less prone to certain outcomes. The literature search was limited to scholarly journal articles and government documents published in 2000 and later unless an article was a seminal piece in the field or contributed to tracking trends over time. The statistics provided are from the most recent year for which data were available. Where possible, data related specifically to boys are included, but when these data were not available, data on youth, ages 10 to 18, are provided. What Factors Increase or Decrease the Risks for Mental Health Disorders?